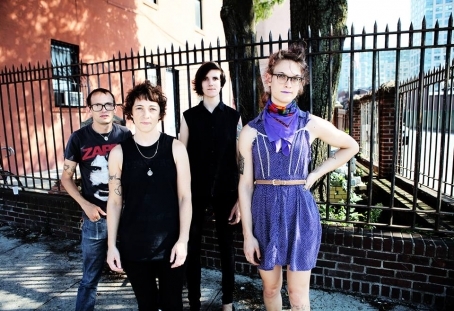 Brooklyn Political punk act, Worriers, announced their upcoming headline show at Mercury Lounge on April 21st, joined on stage by Philly's Pouty (ex-Slutever, Upset) and Don Giovanni label-mates Painted Zeros, who play dreamy post punk and are also based in NYC. 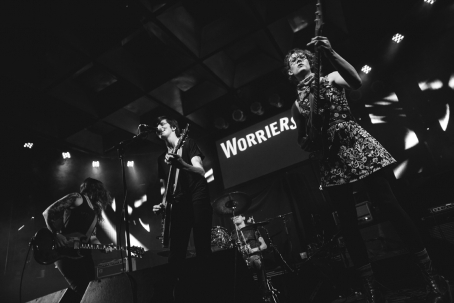 Worriers is currently finishing a 5-week eastern US tour that included dates supporting The Smith Street Band and The Falcon (Lawrence Arms, Alkaline Trio, Loved Ones) along with an official appearance at SXSW. This will be the band’s first New York headline date of the year, after sold-out shows supporting Iron Chic and The Smith Street Band. Kids these days might not be as nihilist and wild as they were in the late 70s, but this isn't preventing the NYC punk scene from being alive and well. Brainchild of the former vocalist/guitarist of The Measure Lauren Denitzio (aka Lauren Measure), Brooklyn quartet Worriers have been around since the early '10s and emerged last year with their debut album on Don Giovanni Records. Their sound offers a sped up version of a brand of melodic punk reminiscent of pioneers of the genre such as Dinosaur Jr and Husker Du - a band with whom they occasionally share a political approach to songwriting. Worriers just announced their new LP 'Imaginary Life', scheduled for an August 7 release, and unveiled single 'They / Them / Theirs' (streaming), which questions notions of the gender binary and the frustrations that come with it. The band is starting today an extensive US tour.